The following page actually was intended to become a short blog entry. However, doing some research on it and talking it over with other teachers it suddenly blew out of proportion and I decided to include it as a page. Nevertheless I would see it very much as work in progress waiting for your comments :). Should there be TL (target language) requirements for CLIL teachers? Many European countries take the CEFR as yardstick for any CLIL teachers’ entrance qualifications. If so, B1/B2 is most common. 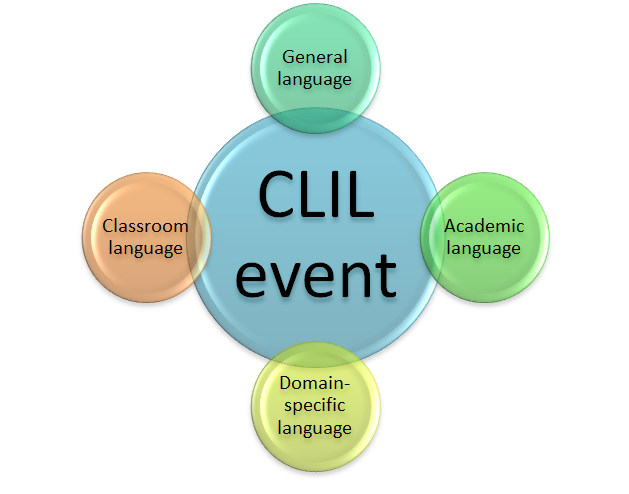 A CLIL event is a complex linguistic enterprise with various “languages” involved. A L4C (Languages 4/for CLIL) model is proposed. Why thinking CEFR may distract from the real language issues in CLIL and why the L4C Model may be more helpful. According to a recent OECD study (2009) teacher quality is one of the most important schooling factors influencing student achievement. The difference between having an effective versus an ineffective teacher is estimated to be equivalent to a full year’s difference in learning growth for students. Moreover, the impact of differences in teacher quality outweighs the impact of other educational investments, such as reductions in class size. This raises an important question in CLIL training and research: In which respects can the CLIL teacher’s foreign language competence be seen as a quality indicator of his or her teaching? The starting point for my blog reflections on the issue of language competence for CLIL teachers was the request for a review of a Spanish research project which investigated into the language competence of CLIL teachers in the Madrid region. The outcome, as I have also found being reiterated in other countries and CLIL contexts, appeared straightforward and clear. Train non-language teachers to pass a CEFR level – mostly B2 or C1 – and half the CLIL battle would be won easily. However, as I will argue a little further, given the linguistic complexity of any CLIL incident, this can lead to frustration and quality loss (see also post entry on the Andalusian teacher situation). is the teacher also a teacher of the CLIL target language? has (s)he spent a certain period of time in a country in which the CLIL target language is spoken, for example, studying or working there? has (s)he had any specific linguistic and/or methodological in-service training in the field of CLIL? is the teacher a native speaker of the CLIL target language? has (s)he taken a proficiency examination in the CLIL target language? is (s)he married to a native speaker of the CLIL target language? Italian CLIL teachers’ competence is B1/B2, according to Ludbrook, and in providing implications for CLIL content teacher training, she somehow vaguely states that CLIL teachers should have a level of general language proficiency that allows independent teaching. France: CLIL is typically carried out within the SELO system (Sections europeennes et da langue orientale) with teachers being subject teachers rather than language teachers. In the first years of experimentation, the CLIL teacher was a subject teacher whose foreign language competence was certified by the regional inspector for the language concerned. Generally, this competence corresponded to a B2 level in the European Framework, although some activities were considered as needing a C1 level. In 2004, the Ministry set up a national certificate for teaching in a SELO, the certification complémentaire. Every year, the regional authorities, the Rectorat, organize a regional session open to all qualified teachers, and to initial trainees qualifying at the end of the year. Candidates must submit a paper giving their qualifications and motivations, and then take an oral exam before a jury composed of subject and language specialists. This certification is valid all over the country (Bertaux). Belgium: The requirements for CLIL teachers comprise a basic (sic) qualification obtained in the target language and/or certificate of upper secondary education obtained in the target language. Spain: Sacramento Jaimez and Ana M. Lopez Morillas (2011), as proponents of the Andalusian plurilingual program in primary and secondary education, report that B-2 has been set as the minimum level a content teacher must have in order to apply for a definite bilingual post. 4) have taken a language test or examination (see Figure 4.3). Needless to say that most of these language requirements for CLIL or any preparatory courses for CLIL go hand-in-hand with carefully elaborated and detailed statements on the methodology of CLIL, often suggesting various CLIL models and principles (for example, see another page on this blog). Interestingly, some proponents would even go so far as to compensate foreign language deficits with more advanced methodological skills. Jaimez and Lopez Morillas (2011: 82) consider methodological updating essential in the Andalusian bilingual education model “in order to compensate for the lack of confidence and competence in the use of the foreign language”. This assumption that methodological (pedagogical) skills can compensate for content competence or subject knowledge or vice versa, is one that I have come across many times and in all sorts of shades in my educational career. Metaphorically speaking, this could be compared to the idea of who is the best football coach? Someone with a personal international career or someone who spent the same time reading a lot about the “beautiful game” and all the psychological and sociological aspects connected to it? Furthermore, Coyle’s (2008: 101) observation that CLIL pedagogies have been highly influenced by language acquisition theories which favour language teaching perspectives may also play an important role in the animated discussion on CLIL teachers’ language competence. Summing the data up the following picture emerges. The diversity of opinions, the lack of authentic teacher data, and the linguistic complexity of any CLIL event seem to make an approach whose language requirements are (almost) exclusively based on CEFR scales strongly questionable. I would therefore like to propose a more elaborated model that covers the linguistic multiplicity of CLIL and through this may allow better planning, preparation, and teaching of any CLIL incident. This model consists of four “languages” that merge to create an appropriate linguistic CLIL event. General language: This comprises advanced general everyday language competence as covered by the CEFR scales, also comparable to Cummins BICS http://www2.education.ualberta.ca/staff/olenka.Bilash/best%20of%20bilash/bics%20calp.html . Depending on the CLIL’s teachers teaching context (primary, secondary, tertiary level) B1 – C1 may be advisable. Michael McCarthy and Felicity O’Dell (2008): Academic Vocabulary in Use, CUP. Cambridge Academic Content Dictionary, 2008, CUP. David Porter (2010): Check your Vocabulary for Academic English, Hueber. David Porter (2007) : Check Your Vocabulary for Academic English: All you need to pass your exams, A&C Black. Diane Schmitt and Norbert Schmitt (2005): Focus on Vocabulary: Mastering the Academic Word List, Addison Wesley Pub Co Inc.
Subject/Domain Specific Language: This is language that almost exclusively appears in relatively restricted areas/domains, such as “hibernation” in biology or “precipitation” in geography. Some researchers also use the word “technical terms” (Nation, 2001). However, these expressions are very often keywords in the understanding of domain specific concepts. Various measures could be taken to ensure a satisfactory training in this language area. Experienced subject teachers together with their language colleagues put up a bank or an inventory of domain specific key-vocabulary. Shadowing of mother tongue teachers in the respective subject. For example, an Austrian history/CLIL teacher attends lessons in an English teacher’s history class doing intensive linguistic and action research. Dialogic learning, which is teaching that centres around conversations with other teachers focusing on teaching and learning issues during which teachers examine their own beliefs and practices and engage in collaborative planning, problem solving and decision making (Burns & Richards, 2009). Using and linguistically analysing information technology data to gather relevant subject specific language data. CLIL supporting learning styles such as collaborative learning, discovery learning, team-teaching, etc. So at the end of the day this raises the need for some serious subject specific linguistic soul-searching, or in other words, collecting and evaluating data from CLIL teachers in action. Burns, A., & Richards, J. C. (2009). The Cambridge Guide to Second Language Teacher Education. Cambridge: CUP. Cummins, J. (2008). BICS and CALP: Empirical and theoretical status of the distinction. In B. Street, & N. Hornberger, Encyclopedia of Language and Education (2nd ed., Vol. 2, pp. 71-83). Springer. Dafouz Milne, E. (2011). English As the Medium of Instruction in Spanish Contexts: A Look at Teacher Discourses. In Y. Ruiz de Zarobe, J. Sierra, & F. Gallardo del Puerto, Content and Foreign Language Integrated Learning (pp. 190-209). Bern: Peter Lang. Nation, P. (2001). Learning Vocabulary in Another Language. Cambridge: CUP. OECD, 2009. Evacuating and rewarding the quality of teachers: International practices. OECD Publishing.